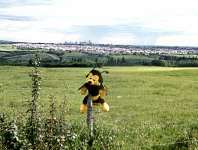 Benny the Bee checks out the farmland around Calgary, with the city just barely visible in the distance. Calgary is a modest sized city, about one million folks, with lots of immodest scenery surrounding it, and quite a bunch of attractions. The Rockies are just a forty-five minute ride away, the Badlands start an hour to the east. In the badlands, you'll find the world famous dinosaur museum, the Royal Tyrrell, or you may wish to see the bone beds themselves at Dinosaur Provincial Park. The Rocky Mountains, Badlands and Plains offer fossil hunting, active sporting opportunities, and falconing. If you want an adventure-wildlife tour, talk to Alberta Wildlife Viewing Tours. The city itself grew from a tiny fort to a major city, and has professional hockey, has hosted the Winter Olympics, has an annual Winter Festival, Children's Fest, Folk Festival, Canada's biggest zoo, world famous horse showmanship at Spruce Meadows, a thirty storey tower, some 50 storey office towers cultural diversity ranging from Canada's first people to a Chinese Cultural Centre, a bright, clean downtown, the highest office towers west of Ontario, a big petroleum business a world famous cow stampede, a booming city attracting immigrants from around the world, and one of the best honey farms in the world! We offer free, educational software about Canada. To get this free software, go to our Canada Trivia Software Page. If you want to learn more about Calgary, you could check out our local paper, or contact the University. If you want travel information, we have not one, but two sources of great info about Alberta. For Canada travel information, you will need to look elsewhere.